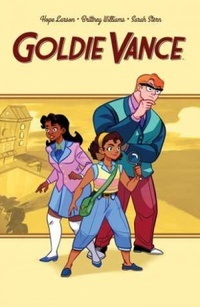 Sixteen-year-old Marigold “Goldie” Vance lives at a Florida resort with her dad, who manages the place. Her mom, who divorced her dad years ago, works as a live mermaid at a club downtown. Goldie has an insatiable curiosity, which explains her dream to one day become the hotel’s in-house detective. When Charles, the current detective, encounters a case he can’t crack, he agrees to mentor Goldie in exchange for her help solving the mystery.